Is Darth Vader's temple on the exact spot on Mustafar where Anakin was defeated? After watching Rogue One again, I pondered upon the location of the temple on Mustafar at which Darth Vader is seen in meditation. As we all know, Darth Vader underwent a battle on this planet that did not end in his favor (to put it lightly). As he is a dark side practitioner, and the dark side feeds on passion, it makes sense that he would meditate in a location where he undoubtedly had some strong emotional connection (not only was he mutilated, but he also believes he murdered his beloved just prior to this). the temple is built on the top of a lavafall. During Revenge of the Sith, near the end of the Darth's battle with Obi-wan, they fight on a lavafall. It seems to make sense that he would choose to build a a temple near this location, so he could overlook the spot where his transformation took place. Is there any evidence to support or deny the claim that this is that same lavafall? @WingKongMan Mustafar looks different in Rogue One. Less Volcanic then Ep III. Design change? Or does the planet go through cycles? 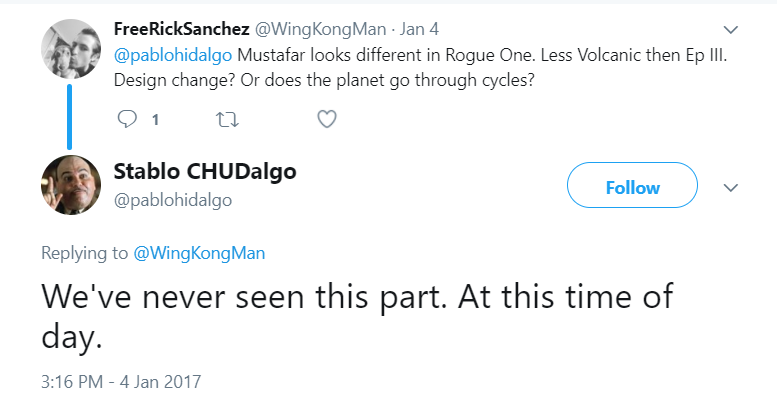 @pablohidalgo We've never seen this part. At this time of day. Surprisingly, Darth Vader constructed his own castle, a testament to his might, at the site of his greatest defeat: the fiery lava-world, Mustafar. 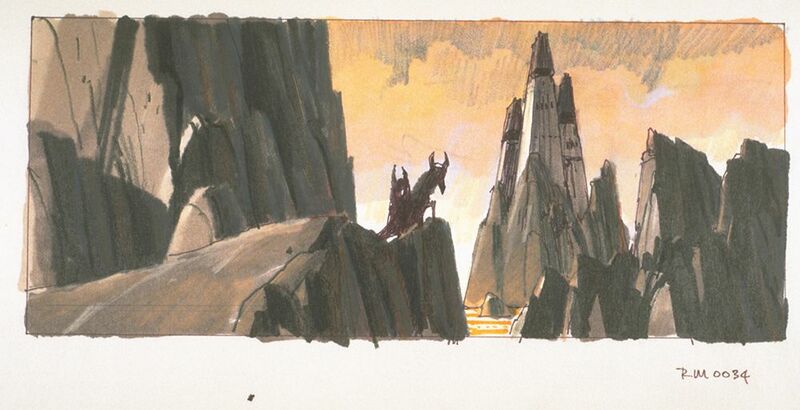 The location and design of the castle came as much from the dark side as it did from Vader's personal history, however; the complex sits atop an ancient Sith cave, and the tuning towers serve as a conduit for the dark side of the Force. While this doesn't tell us whether or not Vader's castle is close to the site of his battle with Obi-Wan, it does tell us that he wasn't thinking of that connection when deciding where to place it;any similarity would appear to be pure coincidence. How does Vader (and how do other Sith) meditate? Why was Anakin sent to the Temple? When did Emperor Palpatine first reveal the post-Mustafar Darth Vader? Was the Jedha temple site inspired by the Acropolis hill?